Promotional notebooks are among the most popular promotional products and thus these pads will be found in any handbag or briefcase today. Individually printed notebooks with your corporate design are among the promotional storage & organisation classics and the secret is in their universal practicality; these notebooks accompany customers, employees or business partners as an indispensable planning tool in their work and everyday life. Other everyday products we supply include promotional printed lunch boxes, keyrings, pens, umbrellas, mugs, wallets and lanyards. Whether you want to store ideas, sketched out thoughts and spontaneous inspiration, their necessity is unquestionable and so is their promotional effect. At allbranded we can offer you a large range of promotional notebooks in different formats, colours and materials. 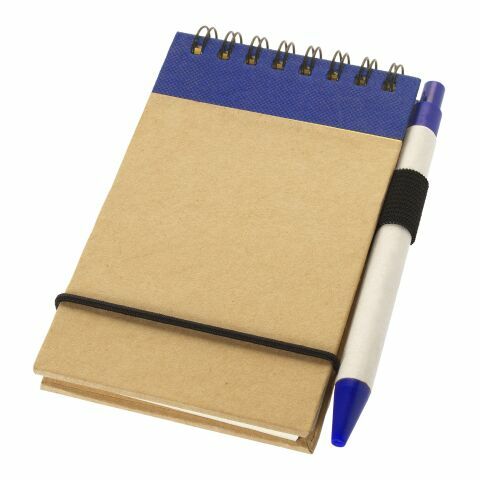 An A5 hardcover office notebook with rubber binding and 80 grams of paper in an exclusive design, perhaps a practical pocket notebook with leather-binding for a greater modern/work look. We also have plenty of cheap variants of notepads, such made from recycled paper, making way for any eco-conscious target populations. In the same way, you can make full use of content design as we even print the inner cover according to your wishes. Of course, we offer you numerous possibilities of printing, so that your notebook becomes an eye catcher with every use, thought or idea you want to jot down! When discussing the medium to store writing, we find ourselves going back into the ancient times of where writing itself was first perceived; Mesopotamia around 3200 BC and Mesoamerica around 900 BC saw the first forms of written communication engraved on stone. It’s only been in the last 100 years where we found a way to record writing in a simplistic, portable and compact manner. Thomas W. Holley from Massachusetts was said to have invented the first legal pad in 1888 in an attempt to amass more space for information on paper. He made use of scraps from numerous factors and stitched them together. In 1902 J.A. Birchall from Australia owned a stationery store, and found the existing legal pad inefficient and as such glued together a stack of halved sheets of paper, supported by a sheet of cardboard and named it ‘Silver City Writing Tablet’. The uses of printed notebooks are twofold; their primary practical use and their promotional capabilities are not to be discounted, all optimised with the use of colour by allbranded. Much like with books, the front cover either attracts our attention or they don’t. This in itself reveals just how strong marketing can be and the combination of a quality, every-day item that not only looks great but is branded with your aesthetically pleasing company logo, making use of colours to the max means the possibilities are infinite. For more options do check out our range of promotional promotional piggy banks, keyrings, pens, umbrellas, mugs, wallets and lanyards. So keeping this in mind, consider just how you could please your business partners for example, with small notepad cases to provide space for their business cards or by selecting a more premium promotional products that can accommodate all kinds of events. All our notebooks are equipped with high quality paper and colour and thus maintain the records of your customers well established in the neatest possible presentation available. Printed notepads make excellent gifts for your fellow desk buddies, employees, customers or incentives for clients-to-be, so why not open those doors now that allbranded has unlocked them? Give away pads as gifts (or gift bags of pens, mugs and umbrellas) at conferences or events where you get to know new business partners and new leads. Why? Because you can never have too many ideas and therefore too many mediums to preserve these on, coming particularly handy in lectures. So next time you are sitting at your desk, with some pens in front of you, organise your thoughts, make use of our notebooks and find just how you can optimise colours, slogans and essentially your brand by simply making use of these pads. Answer your inner creator, visionary and entrepreneur and never let any valuable ideas slip away ever again by partnering up with allbranded. Consider the visual association made by existing customers and customers-to-be, by making use of a product full of possible colours, that provides an outlet for their creativity; your brand will be synonymous with innovation, creativity and ingenuity! For more effective branding, check out our printed keyrings, pens, umbrellas, mugs and wallets and find how easy marketing can be!